Well, this is the end for The Corn People, 2018, and Skull Valley. We'll ride out the end of the year with December's release by the humanoid vegetables. After hearing many of the other monthly Corn People albums, I can say that 2018 was surely, the Year of the Corn. The cover art to Year of the Corn is minimal. It's kind of like the Black Flag logo but thankfully isn't an irritating parody. It's a nice design, but I don't like that the cob on the right goes off the side. The Corn People are off; the first track is "We're Going Home", a tune that warps away with whirring sounds and a nimbly bass pushing the engines. This track really shows the dramatic tension in the launch. I actually like that it fades out; this isn't the whole story. "I" is a short, fast piece of stuff; stuff happens, and this is one of the pieces of that ball of stuff that we call the universe. Next is "60 55 101 57", an eerie soundscape of lingering peril that only stays for a chill, and then we head back to the stuff with "II", a drifty dream of drowsing damsels with bright hair in various colors amidst a neon-colored skyline in the day that is the future of our world. "Radio C.O.RN." is really cool, another semi-ambient piece in crystalline space. A simple progression provides the main unit with power. There's a big, dissonant change up at the end. "In the Field" follows; it seems fairly bumpy unlike that flat field that Bauhaus sang about. This song is all jumping drums and hollow airborne synths, kites in the musickal wind. "III" is an awkward chirping bird with propulsive feathers singing a short song. It works by the end of the track, but the startup is mediocre. Now it's time to "Escape This Rock", at least for The Corn People. This eighth track is whimsical, the old sound of the Corn Carnival as in the history of this corny crew. In "Find the Answer" The Corn People have gone way out to the place where vector-based beings live. This place is at least four light years away. There is not much sound here that one would hear on the planet Earth. This track is a great mirage of noise akin to something that might be heard on the soundtrack to Forbidden Planet, something that The Corn People have been getting better and better at on The (Candy) Corn People and Revenge of the Stalkers. "IV" is another short and fast piece of rock blast, asteroid rhythm. It comes and goes, and "Lost and Found" is on the other side. This is a harsh piece. Rattling and siren sounds greet the listener into a realm without light. Here, beings traverse by sound alone, distorted by gravitational forces that hiss and sputter. These noise pieces are really well done. "An Ode to Homo Sapien" sounds like a lounge song; that's appropriate for New Year's Eve. I really like the sultry horn, coming in like a big "what?!" and becoming a big "oh! that's perfect!". The track rides out into the worlds that Corn People call home, places that have their own kinds of light and sound, gravity and inertia, places that are not those vector-based voids of the unknown or the fields we know. "So Long, and Thanks For All the Corn", they say, and I agree. Thank you Corn People, brave explorers from the other side. The fanfare plays. And that's the end. 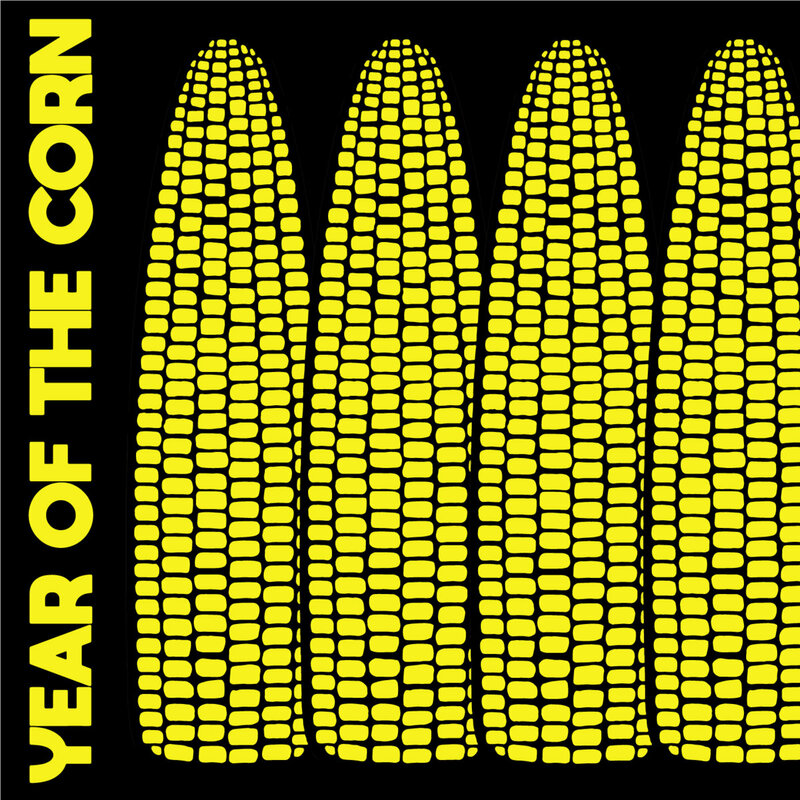 Year of the Corn is a summation of what has come before and a fitting farewell to the strange, starchy songsters. I liked everything about this album; from the danceable rockers to the sci-fi terrors, Year of the Corn makes its mark in history and receives a Good. And, so long for now, 2018! Also, dear readers, I was joking about this being the end of Skull Valley; see you in the future!